Dotty's Cottage01263 715779work01603 870304fax Self-cateringIf you are looking to enjoy a family holiday by the sea in a beautiful coastal location then look no further! Built from traditional Norfolk brick and flint, Dottys Cottage is approximately 200 years old and is situated in the pretty and popular village of Blakeney - a small village which benefits and small but good range of shops, a delicatessen and The White Horse pub which serves good food and local ales - a favourite amongst locals and visitors alike. The cottage has two bedrooms and sleeps up to four people, there is a wood burner to warm up in front of on cooler days and a decked outside garden area which would be the perfect spot from which to read a book or enjoy a meal alfresco on warmer days. 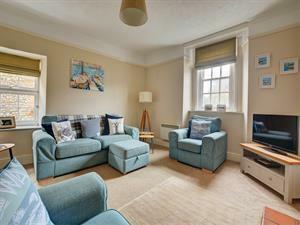 Being centrally located, the cottage is within walking distance of the quay, the shops and the play area. For those who enjoy walking or cycling this is a great place to stay. Pick up the Norfolk Coastal path and in either direction take in the fresh sea air amongst local wildlife which inhabits this area and enjoy breathtaking views. Head west through salty marshland and countryside into Wells-next-the Sea or east into neighbouring Cley which is home to Norfolk Wildlife Trust visitor centre at Cley Marshes where you can sit with a cup of something warm and a cake whilst gazing across the panoramic landscape, you might be lucky enough to spot a Marsh Harrier or two! If you enjoy and adventure be sure to take a boat trip to Blakeney Point where you can see Seals basking in their natural habitat. Some of the longer tour trips allow for an hours stop at the point, why not pack a picnic full of local delights from the delicatessen for a special lunch in a beautiful spot. This really is a lovely place to make treasured family memories. If you are looking to enjoy a family holiday by the sea in a beautiful coastal location then look no further! Built from traditional Norfolk brick and flint, Dottys Cottage is approximately 200 years old and is situated in the pretty and popular village of Blakeney - a small village which benefits and small but good range of shops, a delicatessen and The White Horse pub which serves good food and local ales - a favourite amongst locals and visitors alike. The cottage has two bedrooms and sleeps up to four people, there is a wood burner to warm up in front of on cooler days and a decked outside garden area which would be the perfect spot from which to read a book or enjoy a meal alfresco on warmer days. Being centrally located, the cottage is within walking distance of the quay, the shops and the play area. For those who enjoy walking or cycling this is a great place to stay. Pick up the Norfolk Coastal path and in either direction take in the fresh sea air amongst local wildlife which inhabits this area and enjoy breathtaking views. Head west through salty marshland and countryside into Wells-next-the Sea or east into neighbouring Cley which is home to Norfolk Wildlife Trust visitor centre at Cley Marshes where you can sit with a cup of something warm and a cake whilst gazing across the panoramic landscape, you might be lucky enough to spot a Marsh Harrier or two! If you enjoy and adventure be sure to take a boat trip to Blakeney Point where you can see Seals basking in their natural habitat. Some of the longer tour trips allow for an hours stop at the point, why not pack a picnic full of local delights from the delicatessen for a special lunch in a beautiful spot. This really is a lovely place to make treasured family memories.